Mercury is even more toxic than lead. It works in unique ways. And, it’s immune to the defenses your body can put up against it. Mercury has free rein to travel straight to your brain. There, it lodges itself in the pain center of your brain, and moves out into your nervous system. Mercury then gets to work, preventing nutrients from entering your cells, and refusing to allow the removal of wastes. Even having a little mercury in your system can make you sick. But, it happens all the time, and it leads to conditions like arthritis, depression, fatigue, and muscle weakness. While you may make an effort to avoid mercury in your diet, it’s not that easy. Unfortunately, mercury is in our water and soil, which means it’s also in our food. But, there are ways to avoid the build-up of mercury in your brain and nervous system. And, one of the best ways to do that is to eat more tomatoes. 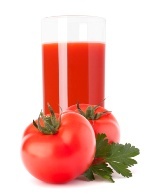 Tomatoes are capable of taking on mercury, and sort of neutralizing it. Researchers at the Universite Laval in Canada examined the effect of the consumption of tomatoes and tomato products on blood mercury levels in Inuit preschool children. A sample of 155 Inuit children was recruited from 2006 to 2008 in Nunavik childcare centers in northern Quebec. Food frequency questionnaires were completed at home and at the childcare center, and total blood mercury concentration was measured by the research team. These children regularly eat seal meat, fish and other foods from lakes and rivers contaminated with mercury, so their exposure levels are quite high (for more on fish consumption and mercury contamination, click here). The researchers found that every time one of the children ate something with tomato in it, there was a 4.6% drop in blood mercury levels. That benefit comes from any kind of tomato product. So, you can help avoid problems with mercury by eating tomato sauce, salsa or any other tomato-based product. Gagne, D., et al., “Consumption of tomato products is associated with lower blood mercury levels in Inuit preschool children,” Food Chem Toxicol. November 2, 2012; pii: S0278-6915(12): 00776-4.